This recipe is one of my all time favourites and a staple in the Fermented Foody fridge. Chop your cucumber into several longish chunks. Chop each chunk lengthways into quarters. Place all the cucumber sticks into a jar. Stir the two together and leave for a few minutes, to allow the culture to wake up. Mix the rest of your ingredients together in a dry bowl. Grape, oak, raspberry, blackberry, black tea, mesquite or horseradish leaves. Don’t use cherry leaves. They have poisonous qualities that are not fit for human consumption. You’re basically looking for a leaf containing tannin, that’s safe to eat. You don’t want to use much because it creates a bitter flavour. I use enough to comfortably cover the ferment and that works perfectly. If you use blackberry leaves you will need to remove every thorn, including those along the stem. It’s a prickly job and I wear gloves for it! I’ve recently used vine leaves and they are much simpler, although not always easy to source. I find if I make several jars of pickles at the end of the blackberry season, those leaves will transfer okay across to new ferments throughout the winter and will still help the cucumber pickles to stay crunchy. You’ll need to experiment with this one, if you’re using different leaves and don’t have access to them throughout the year. 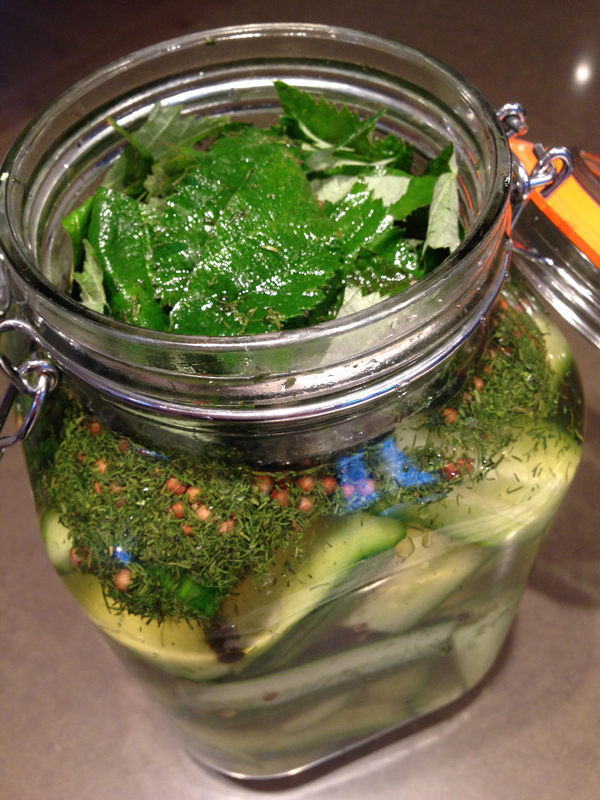 Pour both your wet and then dry ingredients on top of the pickles, top with the leaves and shut the lid. Leave for around 3 days. Keep testing. You will know when they have changed texture and are crunchy pickles. They’re delicious!! Can I pickle eggs this way? Yes, Carol, if you enjoy ‘hot’ tastes, then throw in some jalapeños! I prefer less spice, so I play cautious with hot additions myself! Regarding eggs, I haven’t tried it this way. To be honest, even though it’s very rare, eggs can produce botulism when handled the wrong way and I don’t want to take any risks myself or promote something that could go wrong for others. I’m perfectly happy with fresh eggs. I did pickle some once in homemade apple cider vinegar and they all went rather grey. They went in the bin! I’m sure a pasteurised vinegar could be different. However, see the link below. I like experimenting. After reading more about pickling eggs, I made a decision not to bother. They look so fresh and summery in the mason jars.